Unlike other documents, PDF document is like a snapshot of your source document. You may be tired of finding ways to edit it. With PDFCool Studio, the user can double-click a word/sentence to edit it, or drag an area and then use the Text Editor tool to edit them in batches. The user can also apply the font bold, italic, change the font color and add underline/strokeline to the selected lines. Note: Don¡¯t like any other document, PDF document can not be freely moved or edited items on a page. But if your PDF requires substantial revision, you can choose to make changes to the source document and regenerate the PDF. 3. Press the Enter button to apply the change. 3. The selected text content will display line by line in the upper text box of the Edit Text dialog. Select one line, the text content in that line will also display in the bottom text box of the "Edit Text" dialog. You can modify the text content directly in both of the two text boxes. Note: Click on the three buttons to the bottom right of the upper text box, you can clear the selected line, clear all lines, and restore to the original item. 4. Check the "Full Line Editing" option, and then you can modify the font, font size, font color of the selected lines, as well as apply bold and add underline to them etc in the Font Options box. You can also click on the Font Name text box to open the Font Setting dialog to change the text options. 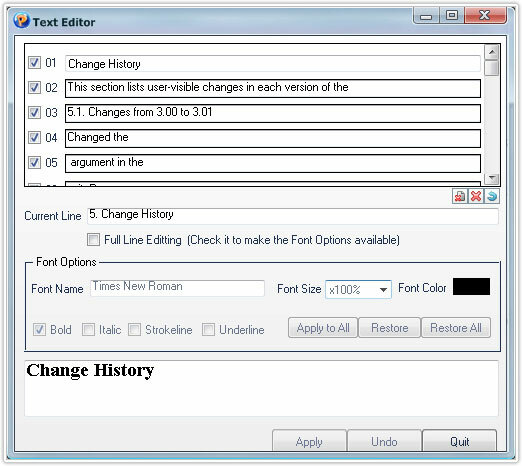 Click on the Apply to All, Restore, and Restore All buttons in the bottom right of the Font Options box, you can choose to apply the parameters setting of current line to all the selected lines, restore the parameters setting of current line to original value, and restore the parameters setting of all lines to original value. 5. Click on the Apply button to finish the edit text process. Note: Click on the Undo button, you can undo the previous operation; Click on the Quit button to save the changes and quit the "Edit Text" dialog.